Home CDN , children , crafts , feature , February , holiday , holidays , homeschool , papercrafts , printables , US , worldwide February 2nd - Featuring Groundhog Day Freebies! February 2nd - Featuring Groundhog Day Freebies! -- A holiday celebrated in Canada and the US on February 2nd. 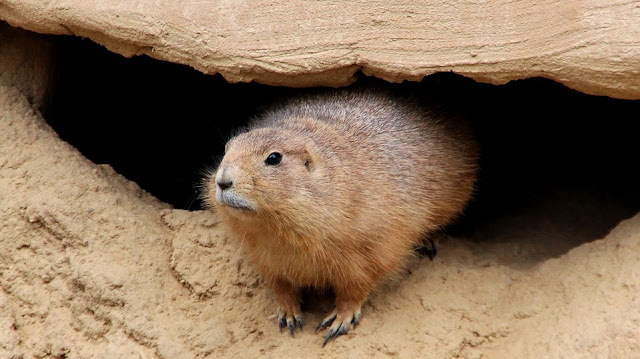 In weather lore, if a groundhog emerges from its burrow on this day and fails to see its shadow because the weather is cloudy, winter will soon end. If the groundhog sees its shadow, it will return into its burrow, and the winter will continue for six more weeks. -- Ever wonder where Groundhog Day first began? Want to know the reason why we have different weather seasons? Curious about how some plants and animals can help predict the weather? Learn the answers to these questions and many more at Groundhog Weather School! This clever story — starring a cast of lovable groundhog characters — is a fresh, informative, and fun look at Groundhog Day through the eyes of the animals who are the stars of it each year. • Color Your Own All About Groundhog Day Poster -- Made of paper. (30 pieces. per unit) 17 Inch x 12 1/2 Inch. These Color Your Own All About Groundhog Day Posters are a fun way for kids to record and share their big Groundhog Day predictions! • WATCH LIVE FROM GOBBLER'S KNOB: Groundhog Day 2019 in Punxsutawney, Pa.
- This is a very important event for us because the days are getting longer and the sun sets a minute later each evening. It is the exact halfway point between the Winter Solstice and the Spring Equinox. It is the winter midpoint or cross-quarter day. The duskiest, coldest season is now officially half over! - The Catholic holiday of Candlemas, on February 2nd, is a feast to commemorate the purification of the Virgin Mary and the presentation of baby Jesus. In France, this holiday is called la Chandeleur, Fête de la Lumière, or jour des crêpes. - The last holiday of the Christmas season. Candlemas is a Christian celebration, or festival, of the Feast of Purification of the Virgin Mary. It also celebrates the annual blessing of candles used by the church. - Heavenly Hash recipes vary from ice cream to brownies and cookies, and to a gelatin-based dessert with rice, marshmallows, and fruit. Most heavenly hash recipes contain either marshmallows or a marshmallow crème or fluff. Over the years many ice cream brands have added their version of Heavenly Hash Ice Cream to the freezer shelf. What type will you enjoy today? - Students spend part of the day in the workplace shadowing an employee as he or she goes through a normal day on the job. Job Shadow Day demonstrates the connection between academics and careers and introduces students to the requirements of professions and industries. - This ancient Roman tradition was the inspiration for Groundhog Day in the U.S. Romans observed whether a hedgehog emerging from hibernation could see its shadow in the moonlight — if it could, then six more weeks of winter were expected. Later observed as a folk holiday in Europe and the British Isles. - When a diphtheria outbreak was diagnosed in Nome, AK (population 1,500), on January 21, 1925, the nearest large amount of antitoxin serum was in Anchorage. Bitter winter temperatures made air delivery impossible, so a heroic dog sled relay was set up. Some 300,000 units of serum were delivered by train to Nenana, AK, and on January 27 — in temperatures of 40–50 degrees below zero (Fahrenheit) — 20 mushers drove scores of dogs on a 674-mile journey to Nome in 127 hours. Togo was the lead dog for the first 350 miles, and Balto was the lead dog on the final 53 miles. The frozen serum arrived on February 2nd, at 5:30 AM. Once it was thawed and administered, there were no more diphtheria deaths. Balto became a national hero, and a statue was erected in his honor in New York City's Central Park. - Bottle caps were originally designed to be pressed over and around the top of a glass bottle to grab a small flange on the bottleneck. The Crown Cork was patented by William Painter on February 2, 1892. It originally had 24 teeth and a cork seal with a paper backing to prevent contact between the contents and the metal cap. - Did you know kiwifruit promotes heart health, protects against cancer and aids in DNA repair, outranks bananas as the top low-sodium, high potassium fruit, is a good low-fat source of Vitamin E, Vitamin C rich kiwifruit may help protect against asthma and is the most nutrient dense fruit? Don't forget to pick up a few kiwis at your local grocery store and celebrate the fuzzy green fruit of the West. - On February 2, 1875, the National Base-Ball League was organized, also in New York City. The clubs represented at the convention were the Chicago, Boston, Athletic, and Mutual clubs; the Hartford, St. Louis, Louisville and Cincinnati clubs made the complement of contestants in the first League season. - In medical terms, this is called constructive rest. In the morning, instead of cozying up to a coffee and the news, try sitting in silence for several minutes. On the weekends, plan things to look forward to, and leave your work at the office. Regularly plan time to connect with other people. Arrange something fun or creative or rejuvenating to do, something that will engage your passion and re-energize your spirit. - At the stroke of midnight on February 2, 1913, Grand Central Station opened in New York City.